Coach Forrest Larson of Lake Geneva Badger High School (Wisconsin) has put together a really excellent DVD entitled "Simplified Run and Jump". I'll present some notes here from the DVD, but if you plan to use the run and jump for your team, you'll definitely want to get the actual DVD, which includes not only all the details and on the court demonstrations, but also a number of very important breakdown drills, which is how the press must be taught. The "run and jump" is similar to our match-up press defense, both using similar concepts and techniques, such as trapping along the sidelines and jump-switching (run and jump) in the middle. Both start out with a match-up, or man-to-man, alignment. Increase the pace, speed of the game. Make conditioning a factor in the game. By pressing and running the entire game, the opponent often becomes fatigued by the 4th quarter. Our practices are up-tempo and our players become well-conditioned. The run and jump makes it more difficult for our opponent to prepare for us, having to dedicate a fair amount of their practice time on beating our press. The run and jump press helps create turnovers, steals, and easy baskets in transition. 1. Initial Pick-up, or Match-up. There are several ways to start the press. A. - Deny the inbounds pass. Diagram A. To speed up the game, apply pressure on the inbound passer and full-deny the inbounds pass. Try to get a 5-second turnover. B. - Play "side-by-side" or even with your man and force (allow) the inbounds pass to the corner (diagram B). When the ball is caught in the corner, we can either trap there, or easily force the dribble up the sideline. C. - The inbounds defender comes off the ball and moves above the opponent's point guard. Diagram C. Notice that X4 is off the ball, above O1. We can use this to double-deny a star point guard. Or this can be used against a team that likes to run through a diagonal cutter (after the inbounds pass), and we have this defender X4 deny that diagonal pass (diagram D). 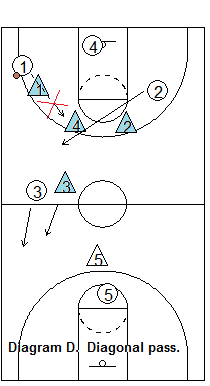 Or we could use this when the opponent's press-break features a 1-up look with just the point guard up (like a clear-out)... we can put our inbound defender X4 above the opponent's point guard and help double-deny him the ball, or force him to give it up if he does receive the pass. D. - Our inbounds defender who is on the ball, can play a "cat and mouse" game. 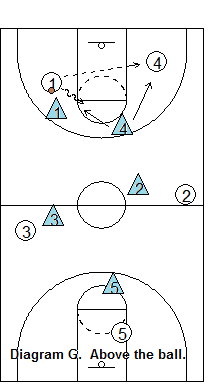 Diagram E. X4 starts out on the passer, but quickly turns around and helps deny the inbounds pass, by finding the cutter. 2. Defending inbounds screens. Players must talk, communicate. They can either fight through the screen, or switch the screen. 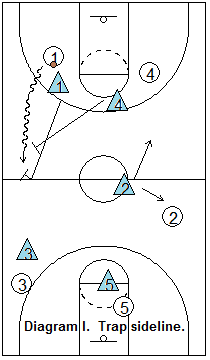 If the screen if switched (diagram F), the screened defender must step under the screen (toward the baseline) to still be in a position to deny the pass to the screener (who actually is often the intended inbounds receiver). Notice that X2 gets screened by O1, but X2 steps under that screen and is still able to deny the inbounds pass to O1. 3. Players must stay above the ball at all times, to be in a position to run and jump-switch and stop the dribble to the middle. This is a critical point in this defense. In diagram G, X4 is in a good helpside position above the ball, and when O1 dribbles toward him, X4 jumps to the ball and stops it. If X4 were too low and over more toward his man (as seen in diagram H), O1 could easily dribble up the middle, and when this happens we are in trouble and the press is beaten. We can't allow the dribble up the middle. 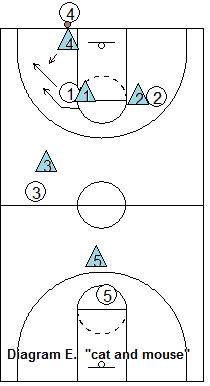 Additionally, if X4 is playing too far over toward his man (not in helpside), he will not be in a position to get over and help trap along the sideline once the ball is dribbled up the side. Going back to diagram G... if O1 passes over to O4, it's no problem as we can play the press from there, and X4 will simply move up and pressure the ball while X1 now moves above the ball toward the middle (helpside). 4. Ball-pressure is key. The on-ball defender must apply pressure and try to get the ball-handler to speed-dribble. He tries to force toward the sideline, and tries to turn ("cut") him. Again, we never want to give up the dribble up the middle. 5. Trap the sideline, and run and jump (jump-switch) the middle. In diagram I, X1 forces O1 to dribble up the sideline, and X1 sprints and cuts him along the sideline. X4 goes up (always above the ball), and looks for the cut on the sideline and immediately comes over and traps with X1. The best time to trap is on a stop or change or direction, when the ball handler cannot see it coming from behind. We trap the dribble, but never the pass. If the ball is passed out of the trap backward to O4, that's no problem as we can recover back and continue the pressure. Diagram J shows the run and jump, or jump-switch, when the ball is dribbled into the middle. Here X4 jumps to the ball and stops it, while X1 who is going along with O1, jump-switches and goes with O4 (once X4 has gotten to O1). We don't trap in the middle of the court, so X1 just goes with O4. 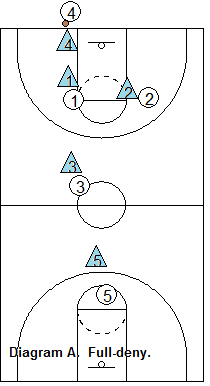 Now X4 applies ball-pressure to O1, and if O1 hasn't picked up his dribble, tries to force the ball to the side. 6. Sprint mentality. We are always sprinting. An important key in "effective" quickness is the initial first two or three steps. A natually quick player who stops and watches for a second may not be able to make the play as well as another player who immediately sprints out those first few steps without first watching the play. Get going and sprint! Players must sprint immediately out of the trap when the ball is passed out of the trap. If they stop and watch for a second, the press gets beaten. So when that pass is made, it's turn and sprint. We also must sprint in our weakside rotation to the paint to prevent a lay-up. Whenever there is a straight line dribble up the middle, all players must sprint back to the paint. The defender who has just got beaten by the dribbler sprints and tries to catch up and back-tip the ball loose with his inside hand. 7. Floor positioning. Players one-pass away should look to either trap the sideline, jump-switch in the middle, or deny a pass on a diagonal cut (or inbounds pass). Players two-passes away should play in the gaps looking to intercept a pass, or decide when to rotate and get back to prevent the lay-up. Sometimes a player gets caught "in-between", which is not good because now he can neither intercept nor help as a weakside defender. He should either try to commit to the steal, or go back with his original man and help back in the paint. The essential, critical breakdown drills that must be run in every practice are all on Coach Larson's Simplified Run & Jump DVD, and are very well-demonstrated with his players on the court. These drills make all of the above concepts easy to understand, and will teach your players how to react quickly and correctly without having to stop and think about what to do or where to go. 2-on-2 drills - sideline trap, run and jump-switch, sprinting out of traps, etc. 2-on-2 inbounds defense drills - inbounds defender on-ball, inbounds defender off-ball. 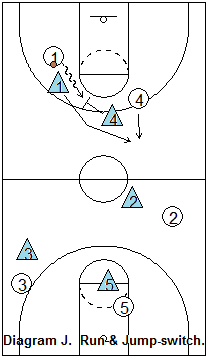 3-on-3 inbounds defense drills - screens, stunting, denying, "cat and mouse", covering diagonal pass, etc. 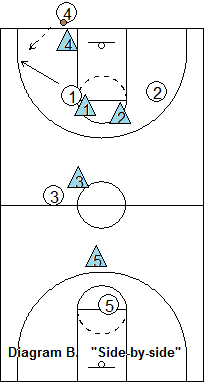 4-on-4 and 5-on-5 drills vs diamond and box sets. 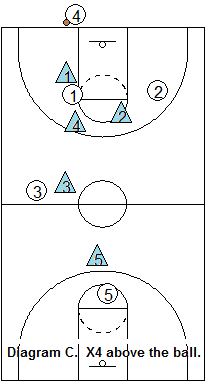 4-on-4 drill vs the Florida set - defending the diagonal cuts. 4-on-4 and 5-on-5 drills for defending the clear-out. 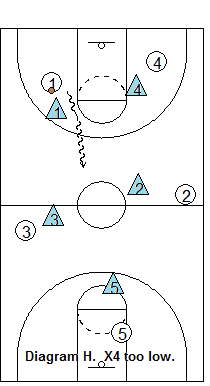 Rotating in the half-court drill - when the trap occurs in the forecourt. 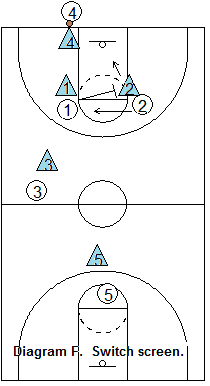 Recovery in transition drills - 3-on-2 & trailer, 4-on-3 & trailer, 5-on-4 & trailer. Get the DVD! "If you want to use the up-tempo run and jump press with your team, or you just want to learn more about it, this is the DVD for you. Coach Forrest Larson does a wonderful job of explaining this press, and his enthusiasm is contagious. - Coach Gels.